Fifty-four miles, that is just over two marathons. I could run that. Not in one day but perhaps a couple. It took 5 days in 1965 when Martin Luther King and many others made that march to fight for voting rights. Voting rights the very things that most of us take for granted. Those were 54 of the most meaningful miles ever. Those 54 miles teemed with plenty of bloodshed, hatred, fear, and hope. Hope for a better life for those marching and for those like me who came behind. Truly marchers made their way through Selma across the Edmund Pettus Bridge, where a blockade of state troopers was waiting for them. Trooper Clark and Major John Cloud who ordered the marchers to disperse. They would not. They did not. In retaliation, Cloud ordered his men to advance. Cheered on by white onlookers, the troopers attacked the crowd with clubs and tear gas. Mounted police chased retreating marchers and continued to beat them. This was known as Bloody Sunday. 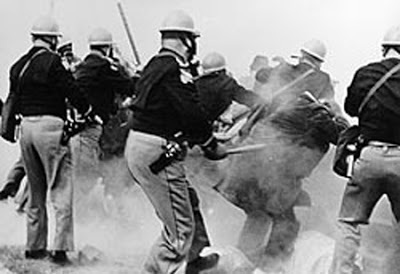 State troopers attack marchers on Bloody Sunday outside of Selma, Alabama. Image via Wikipedia. If it wasn’t for those 54 miles maybe I would not have the privilege of voting. Would I still be valued as 3/5 of a person? Would I be able today to run whenever and wherever I want to? And to think I sometimes complain about the miles I run. I will do my best not to complain about the heat, the cold, the rain, the snow or anything else because I am running those miles freely. I am not running 54 miles away from state troopers who hate my skin color, from those who won’t even take the time to get to know me, from those who are afraid of me due to myths, lies, and stereotypes. I am running just because I can. 54 miles seems such a short distance for those of us who generally run long. It may not be easy but it is doable. And what if we asked 27 people to run 2 miles each? Or what if we ran 5 or 10 miles a day? Would you think about that 54 mile march over your next 54 miles of running? Could you run 54 miles? Would you do that for someone who needs you? For some stranger in the future who you will never meet? Would you do it to affect positive change? People did it for me. They may not have laced up running shoes and run a race. But thanks to them I can. Now I am thinking, wouldn’t that be a great place for a 54-mile race? Previous Pants for Every Runner! I have been whining so much about running lately. I really needed this wake up call. I vow to make my next 54 miles whine-free and to feel grateful for my freedom to follow my dreams. Thank you! I am happy that you will make at least your next 54 miles whine-free. I almost whined today, but thought better of it. I cannot imagine what it must have been like for those who marched.I am still in awe. Thank you for this beautiful post. I know it will stay with me. You are welcome. I think sometimes we forget about the struggles of others when we have it relatively easy now. There is still much work ahead, but there is some progress. Thank you for this well-written reminder of the impetus for the March on Selma. Even for those of us who lived through the time, the details behind the March from Selma to Montgomery get lost.